Stepping out of your car at the Salmonberry River trailhead, it's easy to wonder whether you've walked into a post-apocalyptic Cormac McCarthy novel. 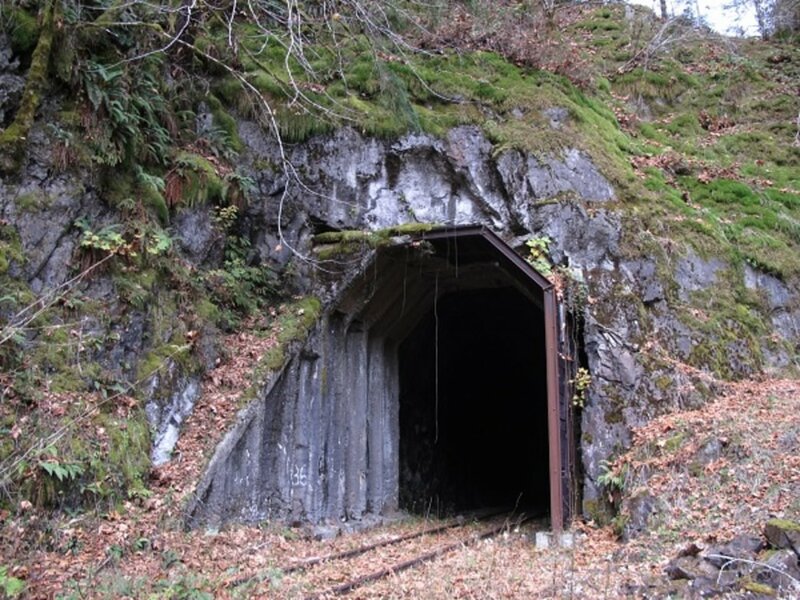 You might hear gunshots in the distance—the Salmonberry River corridor is popular with hunters every fall—and the ensuing hike winds through damp, dark train tunnels and past abandoned railroad equipment, rusted relics of the past left on the side of the trail. And the "trail," which is more or less a set of 16-mile-long abandoned train tracks, probably won't exist for another few years. "It's almost like you're not supposed to be there," says Paul Gerald, author of 60 Hikes Within 60 Miles of Portland. It wasn't always this way, however. Gerald first wrote about Salmonberry River in the second and third editions of his book, owing to the unique nature of the trek. 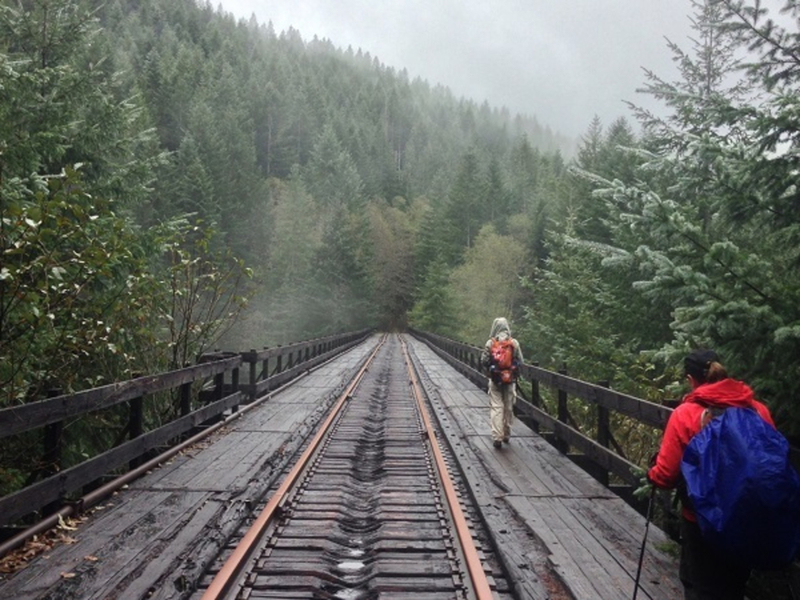 Up until the winter of 2007, hikers walked on and along nearly 20 miles of train tracks in the Tillamook State Forest's lush, forested Salmonberry River canyon. Breathtaking views, resilient wood trestles, and the remoteness of the hike made it worth the nearly two-hour trip from Portland. Gerald removed the hike from his book, given safety concerns in the wake of the storm. But he brought it back for the fifth and latest edition, along with a handful of caveats and warnings about the derelict tracks. “These are scary places. You’re walking on railroad ties, so if it’s rained, it can be slippery. There’s no cell phone reception," he says. "I think it’s completely doable and safe, but just so people understand: The footing is weird. You’re going to have to walk along railroad that doesn’t have anything underneath it." 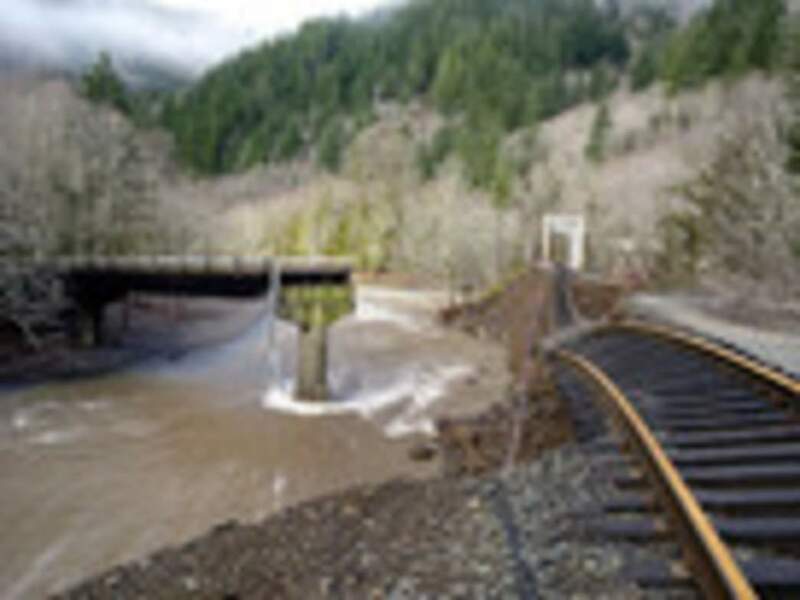 He's not exaggerating: In at least two sections of the Upper Salmonberry River trail, hikers walk on tracks where the ground beneath has completely washed away. Look down, and the canyon floor is visible, at least 50 feet below. And anyone afraid of heights should take special caution: "This is not something that was designed for you to walk on it, and no one’s out there taking care of it, making sure it’s nice and safe for everyone," Gerald says. And yet hikers jonesing for their own "Stand By Me" experience (minus a scary encounter with a steam-powered locomotive, of course) have three options for enjoying the hike. 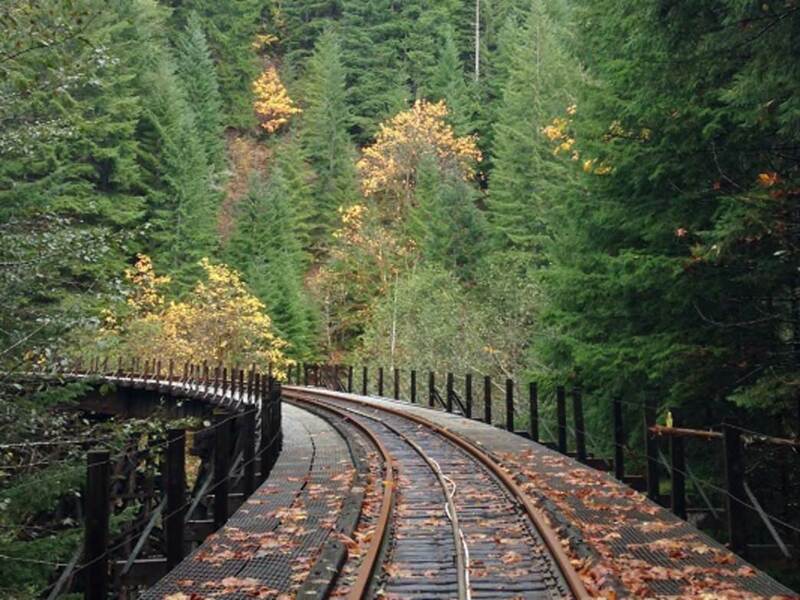 The wooden trestle is more than 100 years old but remained strong after the pummeling storms. "The fact that it survived the flood is remarkable," Gerald says. 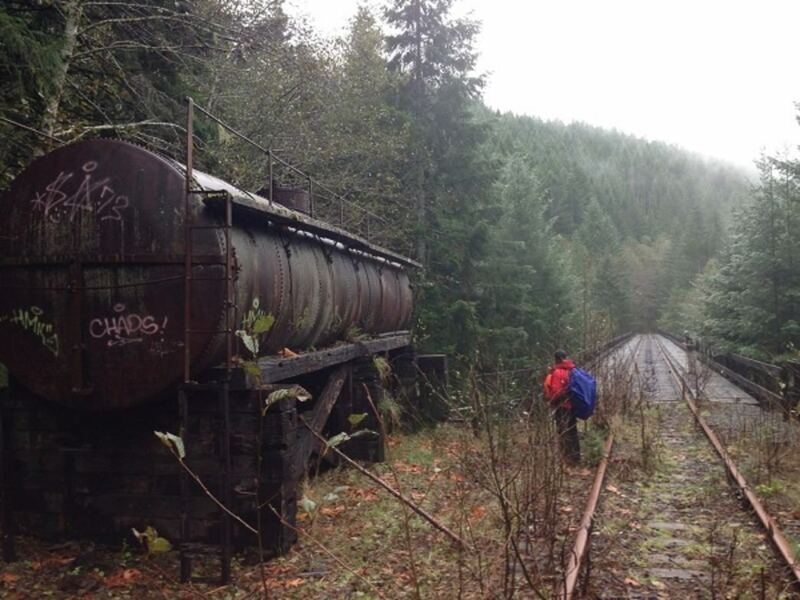 The Lower Salmonberry River section brings hikers in contact with old bridges, abandoned train cars, rusty water tanks, old machinery, and musty tunnels—all of which paints a picture of a bygone era in Oregon history. "You're in the realm of fishing, hunting, logging, and railroads," Gerald says. "You’re literally getting in touch with old Oregon." Whatever option you choose, it's advisable to explore this unique hike sooner rather than later. Plans are in place to establish a trail that may one day traverse the Oregon Coast Range—the Salmonberry Corridor Coalition is working to develop the path—but those efforts may take decades to bear fruit. The proposed trail would, among other things, link up with the Banks-Vernonia State Trail and turn south toward Tillamook in Nehalem, a few miles south of Neahkahnie Mountain. "There’s a funny window where it’s been hikeable for years," Gerald says. "And it may one day be a jewel of a hiking experience. But, in the meantime, it might be slipping away."